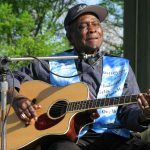 Delta bluesman David “Honeyboy” Edwards has recently gained as much attention for his rich storytelling and the longevity of his life as for the blues he played for eight decades. In 1997 Chicago Review Press published his memoir, The World Don’t Owe Me Nothing. Five years later Edwards appeared as the subject of a documentary film, Honeyboy, another critically acclaimed work that boosted the guitarist’s reputation. Edwards’s career extended into his nineties and carried him from the Delta towns of Mississippi to New Orleans, Memphis, Chicago, and abroad. During his early years in the South he ran in the same circles as and got to know the American blues elite—Charley Patton, Robert Johnson, Howlin’ Wolf, Muddy Waters, and B. B. King. In the later years of his career he fattened his discography with studio and live recordings. Edwards was born on 28 June 1915 in Shaw, Mississippi. He fled the rising waters of the Great Mississippi Flood of 1927, and in the fall of 1929, as the stock market collapsed and depression seized the country, his father bought him his first guitar (used, for eight dollars). At age seventeen, hurting for money but eager to avoid the hand-to-mouth existence of a sharecropper, Edwards took to the road as an apprentice to Big Joe Williams, hitching rides on trains, playing music on street corners and at house parties, hustling in dice games, and sometimes turning to admiring female fans for food and shelter. Edwards soon split from Williams and began to formulate a unique musical style, featuring acoustic guitar and a throaty, soulful voice. In the 1950s, having canvassed the South from Texas to Tennessee, Edwards joined the Great Migration north to Chicago. There he found regular work on the streets and in club venues, and he kept a home in the Windy City for the remainder of this life. Edwards did not find the same success and renown as some of his contemporaries. In 1942 folklorist Alan Lomax tracked down Edwards in Clarksdale and recorded him for the Library of Congress. However, almost a decade passed before Edwards recorded again: under the name Mr. Honey, he cut a couple of records, “Who May Your Regular Be” and “Build a Cave,” in Houston in 1951. Two years later he recorded several songs for Chicago’s Chess Records, but they went unissued until “Drop Down Mama” surfaced in a 1970 anthology. 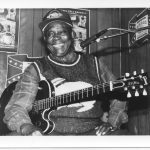 It became his first hit single and was followed by “Sweet Home Chicago,” “Long Tall Woman Blues,” and “Just Like Jesse James.” In the 1970s he formed the Honeyboy Edwards Blues Band, and in the ensuing decades, he took to the studio more often: more than half of his recordings appeared after 1990. 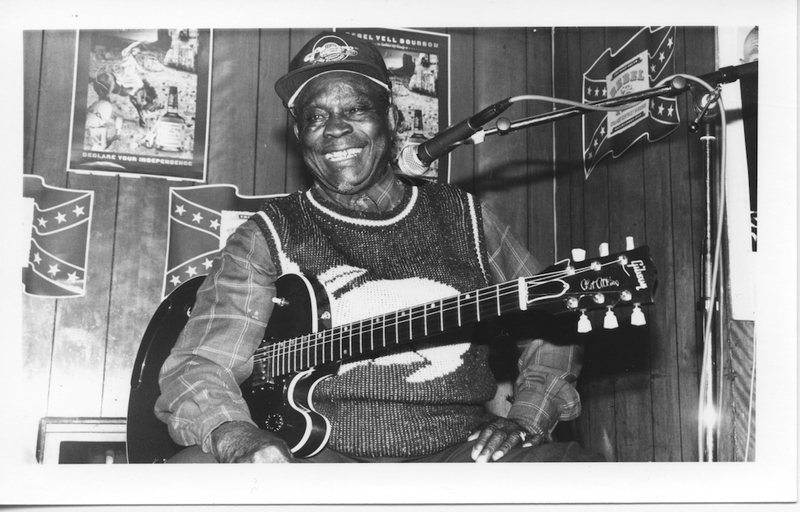 Edwards was inducted into the Blues Hall of Fame in 1996, and in 2002 the National Endowment for the Arts named him a National Heritage Fellow, in conjunction with which the Smithsonian Institution released an album, Mississippi Delta Bluesman. In 2010 Edwards won a Grammy Lifetime Achievement Award and a Mississippi Governor’s Award for Excellence in the Arts. 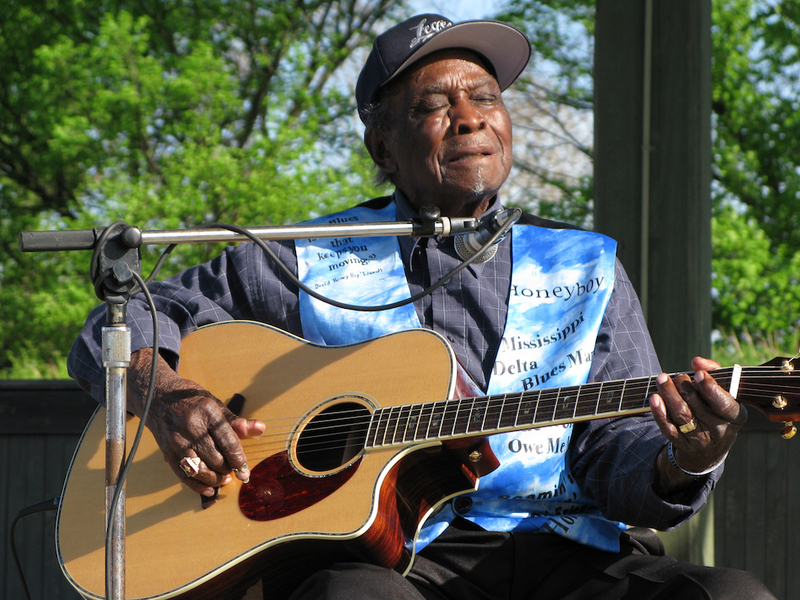 “The last of the original Delta bluesmen” died of congestive heart failure on 29 August 2011 at his home in Chicago, having made his final public appearance at a Clarksdale blues festival the preceding April.